It was the first time I ate Jamaican food and I loved it! So I showed the place to friends and they loved it, too. Conclusion: you should definitely come to 'Negril' and try their famous jerk chicken, the fried plantains or the ackee and salt fish. All is really delicious and you won't regret having come here. It is hard to find good, traditional restaurants. Many places claim to serve oh so traditional food and have oh such a traditional atmosphere, but when you get there it is not like this at all. Well, admittedly, I had no idea about how real, traditional Jamaican food should taste like, but after having read many many reviews about this place by locals and people who know what the dishes should be like, I was quite sure that 'Negril' is the place to be. Type of Place: The restaurant's interior and the way food is presented is very subtle. No overly exaggerated decorative elements, but nevertheless a nice and vibrant atmosphere. It is not too loud, but it is also not the place where you feel embarrassed having a lively conversation. The waiters are really nice and keen to explain everything to you. The first time we went there, waiters were attentive and especially one lady kept checking on us from time to time to ask whether we liked everything. We got our food pretty fast and also when leaving we didn't have to wait for hours to receive our bill. The second time though, the waiters were still nice but they seemed rather inattentive and distracted. They also forgot to bring one of my side dishes. Maybe they had a bad day, I don't know, I guess I have to go there a third time to figure that out, which I am quite happy to do when thinking about the food. 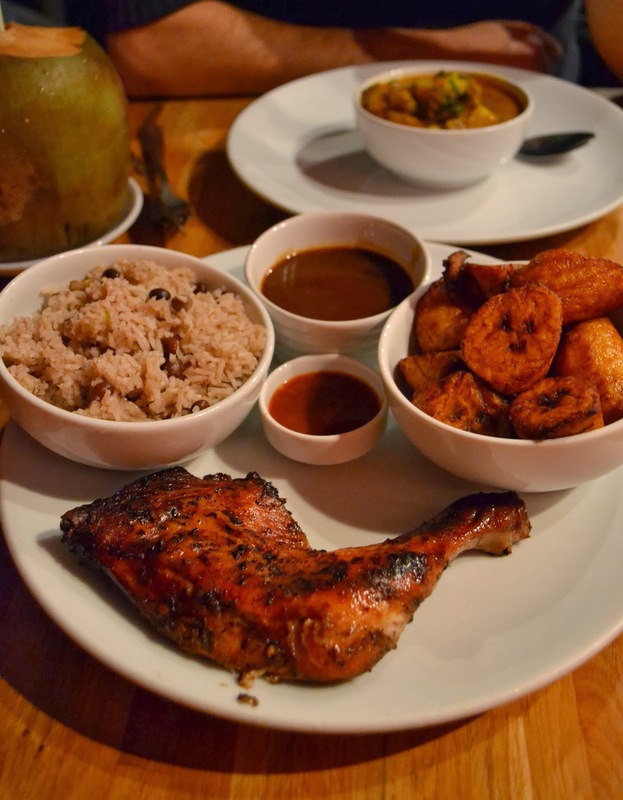 Type of Food: Food served at 'Negril' is absolutely delicious. First, it is bring your own booze for a rate of £2.50 per person no matter how many bottles or glasses or whatever you drink. If you decide though to buy drinks there, you can choose from a range of exotic smoothies and juices, which are great. We had the fresh coconut water, served in a freshly cut, big, green coconut - so refreshing! You can chose from a range of starters as for example jerk ribs, plantain wedges with lime mayonnaise, roti or ackee and saltfish. We went for the plantains, which turned out to be a great choice, because they tasted fantastic. I really loved it, especially with the lime mayo. Also, since we couldn't decide on our main dishes (same old story) we chose the ackee and saltfish as a starter to be at least able to try a bit of it. It was also great, with a lot of nice and interesting spices. The dish itself was set out in many reviews as a must try and since it is the Jamaican national dish I was happy to experience something new. The jerk chicken with two sides and the Goat Curry ended up to be our main courses. Well, chicken and me that is kind of a difficult story. I'm fine eating it, but I am not really a fan of chicken lately, since I somehow had too much of it during the last months. So I read the reviews and everyone basically said you HAVE to eat it at 'Negril', as it is the famous Jamaican dish and particularly here it tastes great. They were not lying, it was so so good, crispy, spicy, well seasoned and my list of compliments could go on like this. I changed my mind about the whole chicken thing (at least counting for this place) and enjoyed my 1/4 jerk chicken with another portion of fried plantain wedges with a very hot sauce (oh you know how much I love well and hot spiced food) and rice with gungo peas, which didn't sweep me off my feet but tasted good as well. The Goat Curry was a good choice too, but it didn't surprise me as much as the chicken, taste wise. It was very well spiced though and also a bit hot. All in all, great food! Go there! Price: Prices are fair and reasonable. You can mix and mingle from the dishes on the menu with main courses ranging from £6-£12, or you simply take the jerk chicken deal where you get 1/4 chicken and two sides for £11. Portions are just right, so don't fear walking out hungry. A dinner for the two of us was around £30, including drinks, starters and mains. Love this article! The food looks so delicious. I am so excited to give this a try. Thanks for sharing.